Kohlrabi can be an intimidating vegetable if you haven’t been around it much. It looks like a leafy, green space alien, and has a taste like fresh, crunchy broccoli stems, with a hint of radish. The name kohlrabi comes from the German words kohl, meaning cabbage, and rabi, meaning turnip—and that kind of says it all about this odd-looking, delicious vegetable. Although these green bulbs look like they were dug up from the earth, kohlrabi is actually a swollen stem that grows above ground. Kohlrabi—or “rabi” for the hip, urban foodie set—is widely used in Central Europe and Asia, but I think the time has finally come for this yummy little Sputnik to land in the United States! The kohlrabi plant is easy to grow, has few pests or disease problems, and grows pretty quickly in cool weather. It makes an excellent, relatively care-free substitute for turnips. There are a few different varieties of kohlrabi, and they come in pale green and bright purple, making quite a show in the garden. When growing from seeds, sow outdoors as soon as the soil can be worked in the spring. If you are in a warmer climate, you may want to start your seedlings indoors, and transplant them out 4 to 6 weeks before the last spring frost. Kohlrabi strongly prefers cool weather, and will lose flavor quickly in the heat, so people will often sow kohlrabi into the garden in the fall, four to six weeks before the first fall frost, so their plants will mature and sweeten in the cold. Kohlrabi are often the longest lasting vegetable in the garden in the fall, and they do very well in cold frames, and even tolerating a nip of snow! Before planting, fertilize your soil with compost or a good organic fertilizer, and then plant your kohlrabi into full sun. You can have a continuous crop if you sow new kohlrabi seeds into the garden every two to three weeks until it gets warm. Plant the seeds ¼ to ½ inch deep into the soil, about three to five inches apart, then thin to six to eight inches apart as they grow. Kohlrabi is seldom bothered by pests or disease, compared to its cousins cabbage and broccoli, but prevention is always the best measure. Choose varieties of kohlrabi seeds that are resistant to the pests and diseases in your region, and plant kohlrabi in a different spot each year to minimize the risk of contracting or spreading infections. If your kohlrabi seedlings have been eaten down to the soil, cutworms are usually the culprits. Sprinkle wood ash around the base of the plants to prevent them. Cabbageworms (the caterpillars of cabbage white butterflies) may bother your kohlrabi plants, but they typically prefer cabbage and broccoli. Use lightweight row covers to keep them off or handpick them. Aphids can deform kohlrabi leaves, so spray them with a non-toxic, insecticidal soap. Drying out is the biggest challenge when growing kohlrabi, because the bulb stems sit upon the ground exposed to the sun. Drip irrigation is highly recommended, but you will also need a mulch of freshly cut grass clippings or compost to keep kohlrabi’s root zone cool, moist and nourished, otherwise you will end up with woody plants that are too tough. Drip irrigation and organic mulch will also prevent the spread of disease through water droplets. Harvest kohlrabi when the stem “bulbs” are no more than 1-2 inches in diameter. 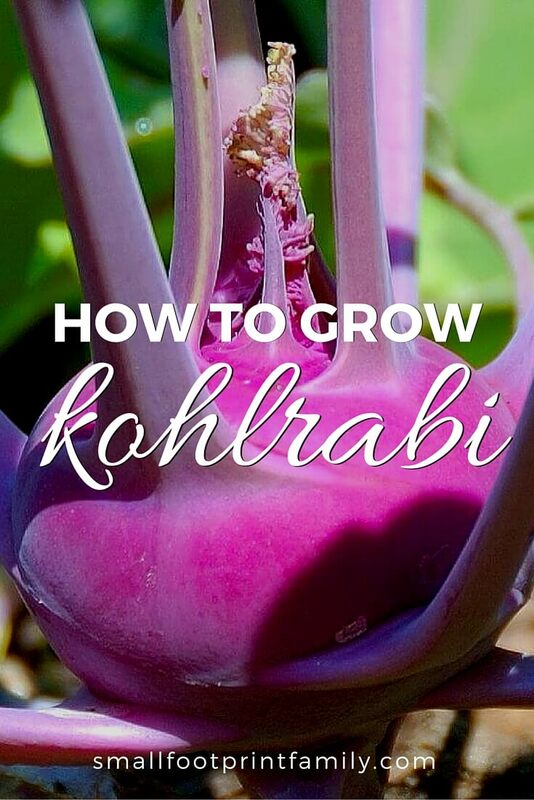 This takes between 40 and 60 days, depending on the variety of kohlrabi you are growing. Any bigger than that, and your plants will likely be too old and too tough. Cut the stems 1 inch below the swollen “bulb.” Remove the leaf stems and leaves, and use the remaining “bulb” in the same way you would turnips. 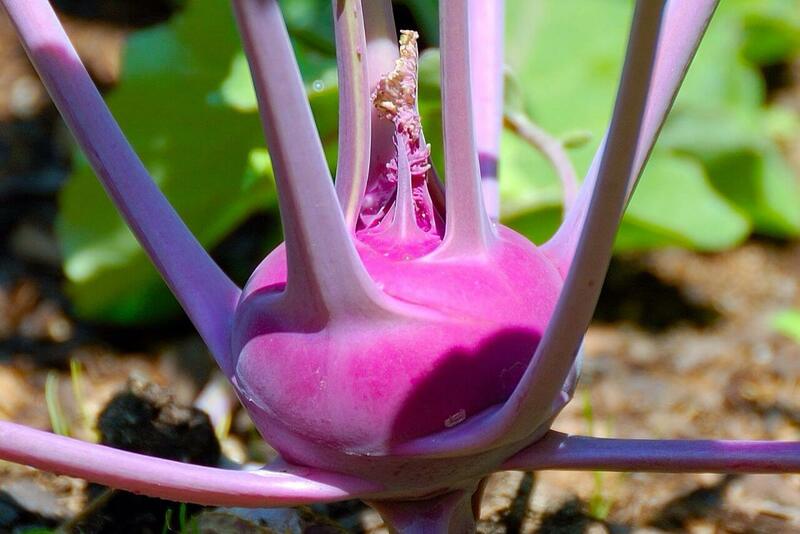 Kohlrabi will keep for several weeks in the refrigerator, and for several months in a cold, moist, root cellar. There are three common ways to make kohlrobi: slaw made by combining grated or julienned kohlrabi with apples; oven-roasted; and blended into a creamy soup. Unless the bulbs are very young and tender, it’s best to peel them to avoid chewy strings. Kohlrabi leaves are edible when young, but most people find them bitter and tough. Really interesting. I never thought of growing this vegetable. Is it spicy? No, it tastes a bit like raw turnip or broccoli stem. It’s lovely prepared any way you’d make brassicas. I was first introduced to kohlrabi by my german mother-in-law. I have grown it because it is very difficult to find in the stores and even Farmer’s Market’s. I love the tangy yet mild taste! Keep us posted on your journey, please. Extremely interesting–never even heard of this veggie! Thanks for sharing w/ Healthy 2Day Wednesday! Hope to see you back next week! Thank you so much – I’ve been sitting here wondering what the heck Kohlrabi was for years. It is apparently on the list of calcium-rich foods and until now, I would not have known what a Kohlrabi was if it came up and punched me in the face. Now my only question is…where can I get some? Any decent grocery store or farmer’s market will have them as they are in season now, between November and March. They are a yummy source of calcium, and vitamin C.